Home » Shopping For A Self Dump Hopper For Forklifts? – What To Look For! Shopping For A Self Dump Hopper For Forklifts? – What To Look For! Self Dump Hopper For Forklifts. By design our self dumping hoppers will release load when hopper contacts the side of the dumpster. Our Self Dump Hopper returns to an upright and locked position mechanically after it dumps. Avnix forklift dump hopper also includes a cable that can be operated from the seat of the fork truck to by hand dump the hopper. A safety restraint is provided to secure the hopper to the forklift. Functional fork pockets are 7½”W x 2½”H. Optional leak proof design sold independently. ER-D-25, ER-D-33, ER-D-50, D-75, and ER-D-100 are stack-able if you stack the top hopper turned 90° from the bottom. Blue baked-in powder-coated sturdiness standard with exclusion of models ER-D-300-HD-NA, ER-D-350-HD, ER-D-400-HD & ER-D-500-HD. Must be attached to forklift when dumping hopper. Recognize your dump hopper fast and effortlessly with our universal color codes. Specialty hopper colors are offered on any size/model dump hopper. Contact Avnix.com for exact model numbers and pricing. The D style self dump hopper side extensions are a big addition for material handling and construction facilities. An added height design offers the standard “D” style hopper with added room to handle materials. The extended sides are constructed of steel mesh for high strength durability during transference of goods, while the yellow painted finish delivers greater visibility to the overflowing items. 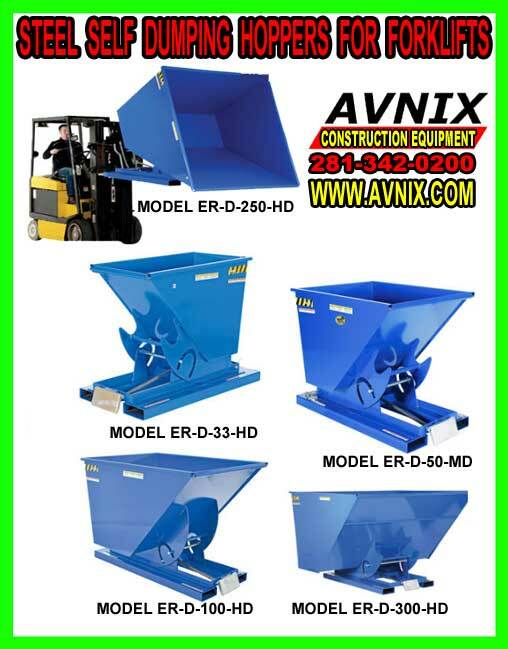 Avnix extra large self dump hoppers are perfect for harsh environments. Dump Hoppers are constructed of 8 gauge steel with a blue painted finish. Uniform capacity is 6,000 pounds. functional fork pockets are 7-1/2.”W x 2-1/2.”H on 28″ centers. A front bumper release, an automatic return to the upright position.2. Full length fork tubes for easy portability.3. A safety restraint for secure transporting while on fork lift.4. A manual pull cable for dumping from the driving position. Call Avnix at 281-342-0200 for caster option.Must be attached to fork truck when dumping. Sideways Tilt Option, model D-TILT, can be used with D-75-LD and D-100-LD hoppers only. User must obtain written permission from forklift manufacturer prior to use. Factory or field installed. May still use hopper like normal. Adds 3-1/2.” to height. Self Dump Hoppers For Sale Call 281-342-0200 For A FREE Quote & Lead Time.